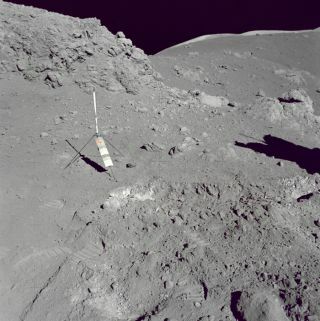 An image shows the orange-soil discovered during the second Apollo 17 EVA in 1972 and the gnomon, a geology hand tool used by astronauts. In this historical photo from the U.S. space agency, a view of the area at Station 4 (Shorty Crater) showing the highly-publicized orange soil which the Apollo 17 crewmen found on the Moon during the second Apollo 17 extravehicular activity (EVA-2) at the Taurus-Littrow landing site. The tripod-like object is the gnomon and photometric chart assembly which is used as a photographic reference to establish local vertical Sun angle, scale and lunar color. The Gnomon is one of the Apollo lunar geology hand tools.